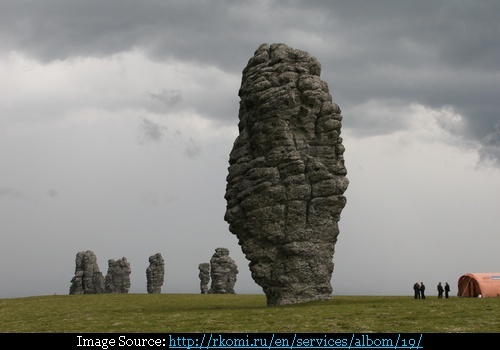 Standing majestically tall are mysterious seven giant rock formations in hard to reach Northern Ural area of Komi Republic. These are known as 7 strong men, however the locals call these as Mansi fools. 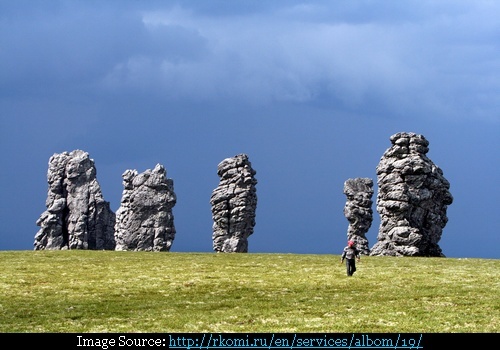 Presence of these seven towering rocks in a flat plateau known as Manpupuner has been a source of great awe and mystery not only to the visitors but to the locals also. No one knows how long ago these were created, however one thing is certain that only nature could create such colossus statues. Geologists believe that about 200 million years ago these giant pillars were part of a mountain. With passage of time, the weathering action of the rain, snow, wind, frost and heat gradually eroded the weak/soft rocks and the hard rocks mainly shale survived to this day. The rocks vary in height from 30 to 42 metres. Out of these seven, six towers are lined at the edge of a precipice and the seventh about 34 metres tall stands somewhat apart from others. As per local legend these rocks are actually reminiscent of a rank of six men lined up behind their leader of giant Samoyeds who had crossed the mountains to attack the local Mansi people and were turned to stone when they encountered the sacred Mansi’s Mount Yalping-Ner, hence the name Mansi fools.